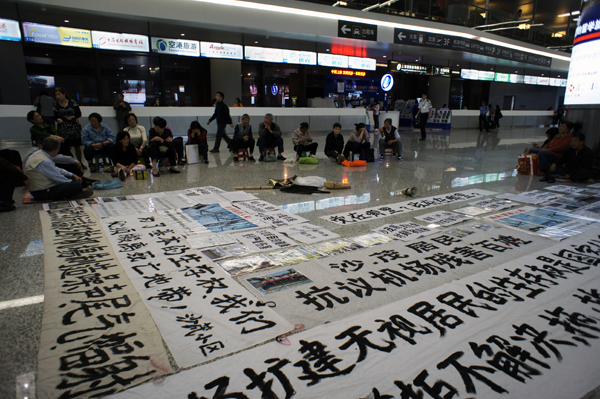 An expected piece of protest occurred at SHA airport during the National Festival in Shanghai. 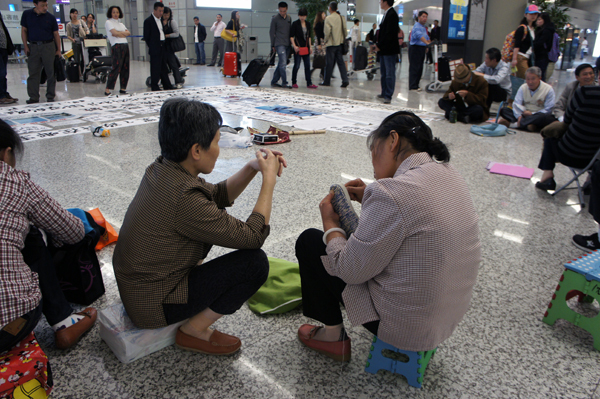 Villagers surrounding the airport united in the hub of their neighbour to stage direct conversations with its passengers. 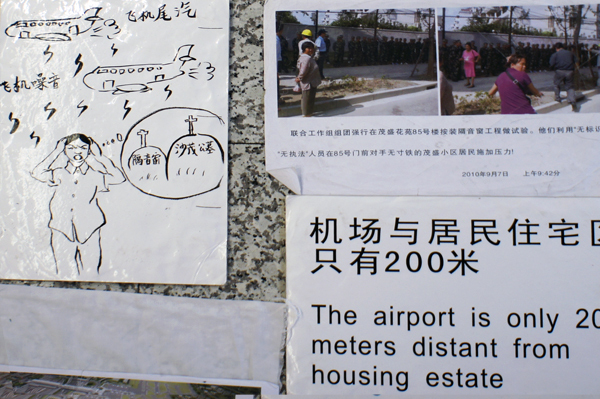 The event suddenly made the border ‘space’ of the transient land into an immediately recognisable residential square. The event drew in quite a crowd. The writings were a magnet for the paper-reading bunch. What’s not to like about an appropriately critical piece of contemplation to be consumed in the limbo hour after one had bought the socks and scarves and gulped the over-sweetened emergency coffee. Harsh words were used, the stage was rather personal. The villagers however kept their cool, most sitting on stools to attend to the display only when necessary. The square was an exhibition of opinions as opposed to ‘activism’. A TV station came to investigate but soon left when they faced more security hostility than the protest itself. 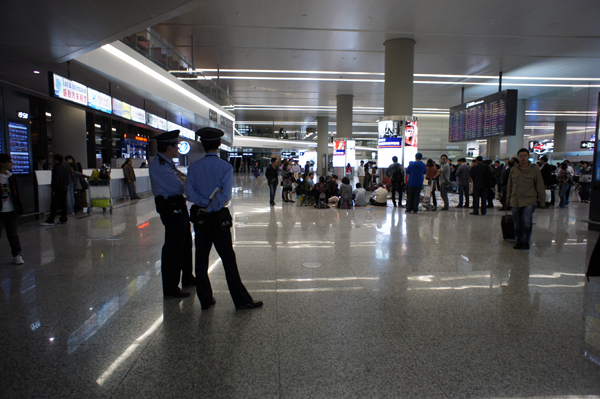 The security watched the locals in amusement, sometimes even helping them arrange for meetings and collect drinks. They had no need to upset the locals, who were possibly families and neighbours behind the austerity of uniforms their sky-blue shirts and hats. It was definitely a good excuse to get out of milling through paper work. 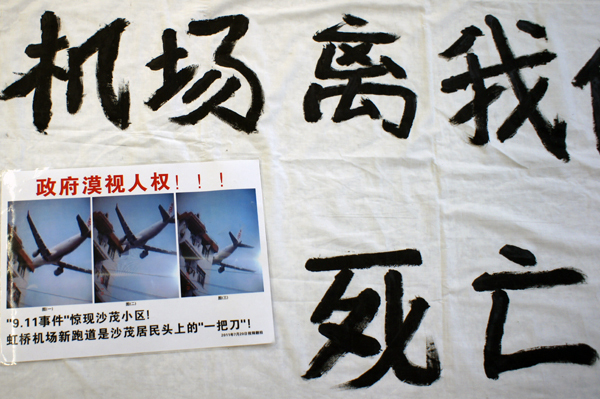 The villagers claimed that the airport is now only 200 meters away from the residential area. This drawing is a rather explicit depiction of their suffering. Most of the villagers wanted to relocate in total surrender. 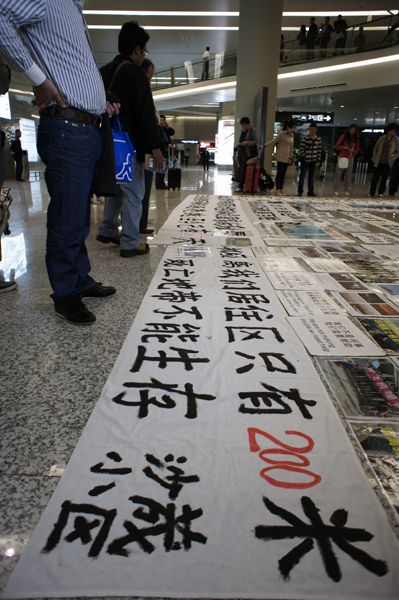 Their demonstration was a bid to gain attention as oppose to preventing the airport’s functions. They were contesting against neglect. In the performance of domesticity, daily household repairs were brought to full view. This was multitasking with meaning. This was their ‘holiday’. The whole village had come into to the airport, a circus of mundane living shown to urbanites racing ahead.